There are three ways to 'paint' a door. Literally with paint, with varnish, or treat with oil if it is a hardwood door. Internal doors can be painted with eggshell, satinwood or gloss paint. External doors should be painted in gloss or water-based external satinwood paint. External doors can also be varnished. Whether brand new or already painted, ideally you should remove the door from the frame, leaving the hinges attached to the frame. If you are painting the door and frame, then remove the hinges completely. Remove the door knob or handle, and any catch plates. If the hinges and catch plates have paint on them from previous painting, simply brush them with paint stripper and wash clean. Remember to use rubber gloves when using paint stripper as it is highly corrosive. Remember to: place newspaper on the floor by a wall and then place the door on two wooden blocks or wedges to keep it off the newspaper. Use a piece of cardboard at the top to stop it marking the wall where it leans against it. 'Top and tail' the door with either one coat of primer or varnish diluted with 25% white spirit to seal the wood. Apply one coat of primer to any areas of bare wood, even if door is pre-coated, followed by one coat of undercoat and two topcoats of satinwood or gloss paint. If the door is plain timber, you can either varnish it with a primer coat diluted with 25% white spirit and then two topcoats of satin or gloss varnish or stained varnish. If the door is going to be painted but has knots in it, treat each knot with a coat of 'patent knotting' to stop the knot burning though the paint and creating a brown stain ring. Hardwood doors can be oiled or varnished as well as painted. Consider using Danish oil to protect your doors if you want to keep a natural look to them. If the door is completely flat, consider using a small sponge roller to apply the paint to give a totally smooth finish. If the door has panels, consider using a small sponge roller for the flat surfaces and a brush for the sunken sections. Remember to sand the door down gently between every coat, except the final topcoat. If painting a panelled door, remember to go back three or four times in the first hour to brush out any runs of paint that may have collected in the panel corners. Don't forget to paint the top of the door. The bottom is OK as it has been sealed when the door was 'top and tailed'! Sand down all surfaces thoroughly to remove any looser flaking paint, and to provide a key for any new paint or varnish applied. Follow all the procedures for painting a new door for undercoating and top coating. If using paint and undercoat has been applied, you can change from satinwood to a gloss or gloss to a satinwood finish. 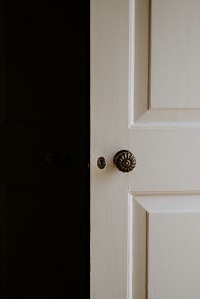 If painting a panelled door, remember to go back three or four times in the first hour to brush out any runs of paint that may have collected in the panel corners.